I just got a Kindle, and it's very interesting. I've had it for about two weeks now, and I must say I like it much better than I expected. I never really enjoyed reading text on a glowing, flickering screen (you'd never know it, right?) but this passive, eInk technology is pretty cool! It looks for all the world like someone ripped a page out of a printed book and pasted on the surface of the Kindle. My only fear (which I'm sure is all part of Amazon's nefarious plan) is that having immediate access to all these books will prove too seductive, and all my money will go shooting over to Jeff Bezos of WhisperNet. You should be able to find free books out there, when you venture beyond the confines of the Kindle store. It supports PDFs, after all, right? The only reason I'd want an ereader in the first place would be to have a better medium on which to read the scores of public domain and creative commons books out there. If I gave in to the temptation to buy the Kindle 2, I'd start with Yokai Benkler's Wealth of Networks. I want to read it, but I just feel like a sucker shelling out money to buy what I can read for free! >It supports PDFs, after all, right? Well, er, no. At least not natively. That's its biggest flaw, IMO. I too have a bunch of PDFs I'd like to read on it, but they have to be converted first. I haven't bothered to experiment much with that yet. It's one of those things that I think I want, and yet, I can imagine it getting entirely too expensive because of all the books on my tbr pile, plus, I kind of like holding an actual book in my hands, you know? 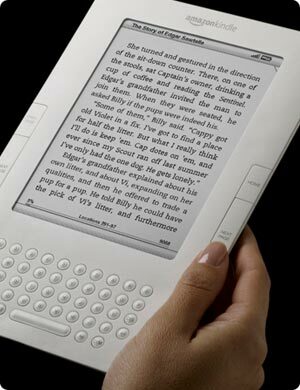 My much more tech-saavy friend just got the Kindle 2 and was telling me he had converted PDFs to view on it no problem. I'll ask him what he did and get back to you.